Hi everyone! Today is the last and final project for the swap I did over at My Scrap Room. I just love the lace border on this Altered Glassine Bag. The pretty lace flowers was one of the items I received in a recent embellishment swap I did. Isn't it gorgeous. I altered a clothespin to clip on this bag to keep it closed. Inside I included some Bling and some pretty patterned bottle caps to alter. Thanks for taking a peek today. Hope you have a fun filled day in the craft room! beautiful vintage bag Carol, beautiful made. This is just as beautiful as your last entry & I thought THAT one was as beautiful as it gets! You have just outdone yourself!! Gorgeous creations (this glassine bag and the other posted earlier)!! What a special way to send trinkets and goodies to your swap partner! You have a talent for taking something that is plain and turning it into something that is truly a work of art! Crystal and I talked about this the other day. She wanted to know how you learned to do all this and be this creative. I told her you had to have been born with it. Lovely work - this bag would make anything seem very special. Hugz - lotz and lotz of them! You're having so much fun with this swap. I can just tell you are. LOL Pretty bag and that lace really is scrumptious. A simple glassine bag turns into a forever keepsake once you get your busy hands on it, LOL! I want to put a sachet in the bag and put it in my nighty drawer! 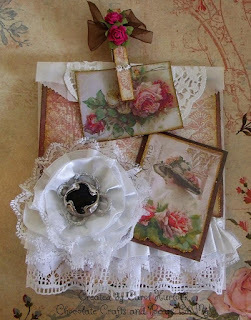 Another wonderful idea and project with vintage roses and ladies, so very pretty. Very nice designed, the flower is beautiful.